Many of you know I do a lot of tweeting out of links to interesting urbanist articles, with some other things that catch my eye. I’ve attracted over 18,000 followers through purely organic growth. You can follow by clicking over to @urbanophile. 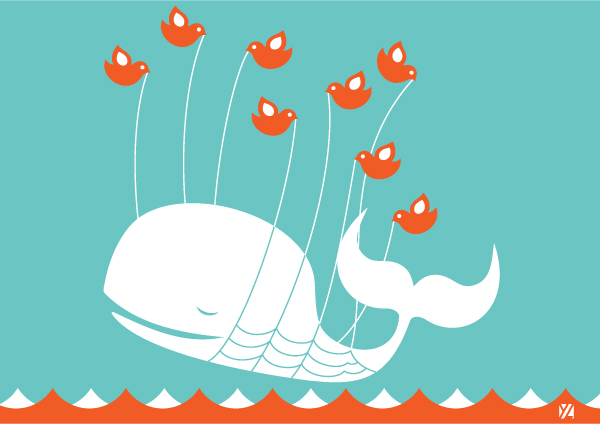 There’s been a lot of press about Twitter’s struggles lately. The company always had a revenue model challenge, but the real problem hitting their valuation is stagnation in their user growth. What caused this? It’s pretty simple: Twitter deliberately shut down product innovation, most of which was developed externally, and killed off much of its ecosystem. Twitter is now less a platform than an app. URL shortening. Retweets. @-handle notation. #-tags. Tweeting images. Tweetstorms. Basically everything that makes the product what it was came from the user community or third party innovators. Twitter, unlike Facebook, used to have a policy of allowing the user the choice of how to read tweets. You weren’t locked into their own products in the way that you are with Facebook. Companies like bit.ly gave you link click analytics. There were apps for tweeting photos. Tweetie created a good Twitter app for phones. And Tweetdeck created what was arguable the killer app for Twitter, which allowed you have multiple columns monitoring various feeds and get on-screen notifications of new tweets in them. Back around 2010-2011, Twitter decided to take back control of the user experience. It bought Tweetdeck and Tweetie, and more or less shut down people’s ability to create their own Twitter clients. It also created its own link shortening service and photo infrastructure. This action more or less ended the era of innovation on Twitter, and certainly had to have made anyone nervous about trying to build a business model around adding value to the platform. What innovations has Twitter created since? Well, there’s their own internal “Retweet” function, which basically everyone hated. The old style retweet only disappeared when Twitter stripped the functionality out of Tweetdeck. Twitter added inline image preview, which is nice. But it’s hard to believe it wouldn’t have become standardized in other clients eventually. There are now analytics available, but a lot of this just replicates what third parties like bit.ly had already been doing. In my view by far the best feature they’ve added is Quote Tweet, which allows you to add a commentary while displaying the context of the tweet you are responding to. It’s basically retweet with commentary and I use it all the time. Quote tweet is feature is really the best cool new piece of functionality I recall them rolling out since they killed off their ecosystem. Twitter may have built the platform originally, but beyond that, they just haven’t proven to be that good at product innovation. Twitter has become a bit stale as a result and it shows in their stagnating usage. What’s more, Twitter has product design issues and in some respects has gone backwards since the days of the old Tweetdeck. For example, twitter only allows you to quote your own tweets in Tweetdeck. On the phone and web site, that functionality is disabled. I use this all the time to add pull quotes or commentary to articles I post. Quoting your own tweets is supremely useful, but the user experience for it is at best inconsistent. Twitter rewrote Tweetdeck (and changed their API to kill off the old one) into what is in some respects an inferior product. The column widths in the new Tweetdeck seem to take up twice as much space as in the old. I used to be able to keep four columns visible easily, now I can only do two at the window size I like to work with. The old Tweetdeck also embedded additional useful third party products. For example, by default it included a window from Twitscoop (now apparently defunct) that had a word cloud of what people were saying on Twitter, along with Twitter’s own (inferior) trending topics. This is what made Twitter the breaking news headquarters of the web. When you saw somebody’s name light up on Tweetdeck, say Michael Jackson, you knew there was a good chance something big had happened. Click the name, and you instantly discovered he was dead. This functionality is now gone (at least by default), and I’ve never figured out how to get it back. For me, since Twitter re-wrote Tweetdeck, I’ve found the product far less useful. I don’t even look at the main timeline much anymore, and haven’t found out any breaking news on Twitter in a while. In short, Twitter’s functionality and usefulness has actually gone backwards in some ways. Combine that with little in the way of real product innovation, and it’s no surprise the platform is stagnating. It’s hard for me to see how Twitter turns the ship around if they continue to want to drive everything internally. Maybe they can change their innovation culture, but given that users and third parties developed most of the cool stuff, their best road is to figure out how to credibly – that’s the tough part given that they already killed their client ecosystem once – reopen their platform to outsider innovators when it comes to the user experience. That is, to become an actual platform again. Unfortunately, press reports have suggested that Twitter likely to instead do one or both of the two things that really would threaten their platform: censorship and filtered feed. On the censorship front, there’s a vocal group of people claiming that Twitter’s user growth problem comes from a culture of abuse, and that’s why they are struggling. This isn’t credible. What’s more, those making the most noise about abuse even sometimes have their own history of behaviors that could be classified as abuse. For example, there’s an article people are gushing over this week that claims abuse is the problem killing twitter – written by a guy who was highlighted on marketing web sites for his participation in the Twitter mob attack on Justine Sacco. Is there some abuse on Twitter? Of course. But a) the rhetoric around it is exaggerated by those with other agendas. For example, situations like Justine Sacco are rare, and seem to result mostly from viral effects, not abusive intent. Is the guy who wrote that article a horrible, vicious abuser of women, or just a guy who clicked retweet on something he thought was funny in the moment? I suspect the latter, so let’s not overstate the case on him. What’s funny when tweeted among a few hundred friends looks different when it’s retweeted a million times. And more importantly b) it’s not abuse but product stagnation that has led to user growth stagnation. Re-open the innovation gates, and if there’s a demand, some third party will figure out how to filter tweets for abuse or anything else people don’t like. (Back in the Usenet days, newsreaders came with so-called “kill file” functionality that filtered out posts from users or topics you didn’t want to see. This ain’t the internet’s first rodeo). This is not really about abuse but primarily about people who want to censor Twitter to eliminate views they don’t like, or to establish a mechanism for and precedent justifying censorship. 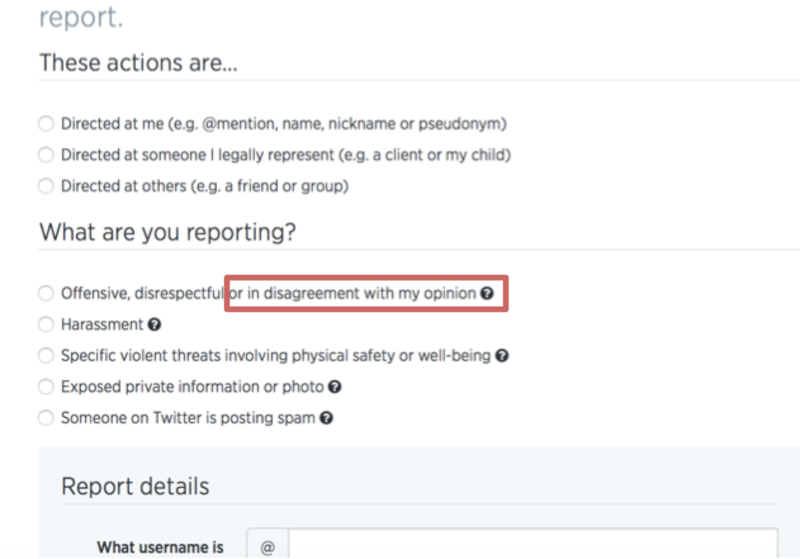 For example, take a look at Twitter’s new abuse reporting page in response to this pressure, which invites you to report people for merely disagreeing with your opinion. People disagree with my opinions all day long! Even President Obama takes being disrespected in stride. If Twitter goes down the censorship road, they are definitely going to take a hit. And it would be a shame. Because Twitter’s lack of censorship is what made it so a great tool during things like the Arab Spring uprisings. But an even bigger threat to Twitter would be implementing filtered feed. This was floated as a trial balloon about a year ago and I haven’t heard much about it since, but you can believe it’s something they haven’t ruled out. In fact, they are already dipping their toe in the water with this through their “while you were away” feature and Moments. What is filtered feed? It’s basically your Facebook news feed. Rather than showing all tweets in chronological order, Twitter would show the ones that they think are “most relevant” and filter out the rest. This has nothing to do with relevance and user experience and everything to do with converting Twitter into a toll highway – just like Facebook. It used to be that if you Liked a page on Facebook, posts from that page would appear in your news feed. Or at least a good chunk of them would. But over time Facebook reduced the number of likers it would show page posts to down to next to nothing. On my Urbanophile Facebook page, I had over 4,000 Likes, but only 50-100 people would see a post. If I wanted more people to see it, I would have had to pay. So even though you said you wanted to see my content when you clicked Like, Facebook wouldn’t show it to you unless I paid up. I decided instead to get out of the Facebook business. The same effect would surely happen on Twitter. Celebrity tweets and such would continue to go through (and Twitter might even pay them to tweet). But everybody else would have to pay up, probably calibrated to people with lots of followers. Who is going to pay? Corporations and institutions of course. People like me who distribute information that my followers (mostly) want to see would simply abandon the platform. Filtered feed would turn Twitter into a glorified ad festival like Facebook. People are willing to put up with that on Facebook because their family and old classmates are there. But will they do the same to Twitter? Color me skeptical. Filtered feed will always be a danger because Twitter is under huge pressure to show a business model, and building a toll highway has worked for Facebook. Making Twitter even less useful through through censorship or the filtered feed toll highway isn’t the answer. If Twitter wants to actually get out of its funk, it actually needs to start innovating again, or better yet let others innovate, in order to generate the compelling value that will start drawing people to the platform again.